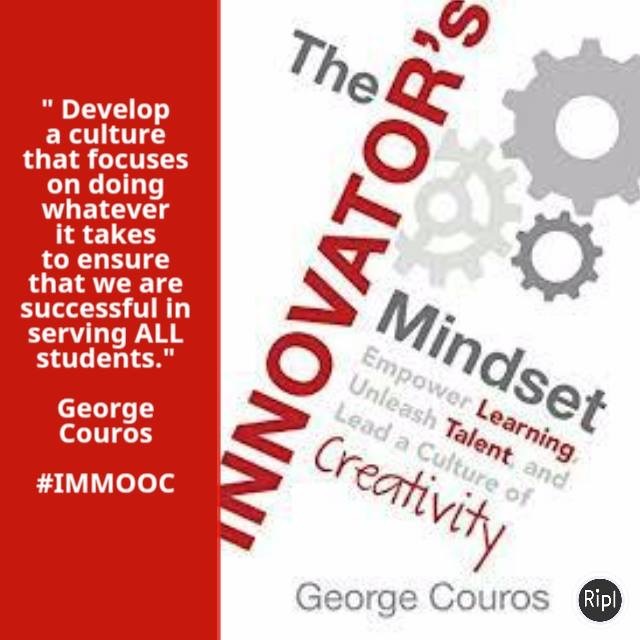 I have really been enjoying my exploration of The Innovator’s Mindset by George Couros and the IMMOOC community. Literally everything on this journey has been pushing me to think NEW not just different! After reading the first section and reflecting for Blog 2 on the critical questions for the innovative educator, they are also critical questions for the special educator. Do I have any special education teachers out there? If you are, you may feel like I do, that all education is special education. The critical questions for innovation remind me of some of the guiding questions you may have as a special education teacher in developing an Individualized Education Plan (IEP). I personally would rename now, as Innovative Education Plan (IEP) since the process in developing an Individual Education Plan (IEP) really pushes you to be innovative to meet ALL children’s needs. When I began reflecting, I noticed as I chose my favorite quotes from section one, they all spoke to meeting the need of each child, ALL children, for me especially the needs of children with special needs. As special educators we take risk every day to explore new learning experiences to cater to the unique needs of each student. Even when we do that, many times they don’t get it! We must remember to not give up when faced with these challenges but look at it as an opportunity to take what you know, find out what you kneed to know and try to figure out a NEW way to reach the learner. In this way you are developing a culture of creation and innovation that does what every it takes to ensure that we are successful in serving ALL students. Innovation begins with questioning, these questions help us to understand the learners we serve and support us in creating learning experiences that are meaningful to them; because, “ a great teacher adjusts to the learner, not the other way around”. It’s not about you! You would recognize the questions have everything to do with the learner and not you the teacher, as it should. Would I want to be a learner in my classroom? It makes you reflect on engagement and determining what type of learner you are serving and how best do they learn. How will I create a learning space that will meet their needs, engage and impact their learning . What is best for the student? This questions is all about creating high learner agency. Making sure your learning outcomes are: student centered, have student voice, constructivist, active and learners have intent participation in their learning. What is the students passion? This questions spurs you to develop strong relationships with your learners. Outside of their academic needs how can you meet the needs of the whole child? How can you create passion projects with that will further fuel their desire to learn? What are some ways you can create a true learning community? Creating a true learning community embodies developing genuine relationships that support engagement, what’s best for the learner, the learner’s passion, flexible and creative learning spaces. How did this work for my students? Though this question is a teacher reflective question, it still focuses on the students needs and how you as the teacher shift and shape new opportunities and learning experiences. These questions are so important to understand those we serve. 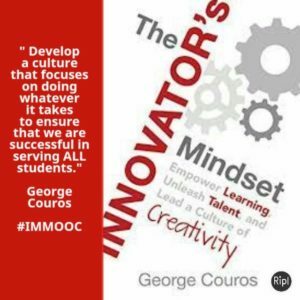 So, should every teacher have a innovator’s mindset? YES! Though innovation is something every teacher should have, I find that our special education teachers have a knack for innovation and these critical questions are are great guide develop the NEW “I” in IEP.